This is a continuation of the previous thread. I'm locking the old thread but it will age off in a few days. 1) The basic guideline for this thread is to list ads and auctions that others may be interested in. It is not intended to replace CL or eBay as a site to find all possible classic ads. Please keep your posts to actual "classic" equipment. If you have to ask if it's classic, it probably isn't. 2) Do not post your own ads or the ads of your friends, this includes items you may be trying sell for someone else. This is considered sale promotion in the open forums and is a violation of the CN TOS. Please post your own ads in the Swap & Shop forum or the Cloudy Nights Classifieds. 3) We request that you do not post photos from ads. If you must have some reference to a photo in the post, post a link to the photo, not the photo itself. 4) Do not post the entire ad text, or large blocks of it, without permission from the author. 5) Concentrate on the item for sale, and not the seller. 6) Although not mandatory, when posting ads, including a short description of the item is a courtesy to others who don't have time to click on every link. It also provides some data when the link is no longer active. Be a little specific. 7) Please post a live link to the item. Do not post "PM me for link". We realize that this is an honest attempt to prevent non-CN member flippers from finding the posts, but most of the hard-core flippers are CN members already. Flippers look for bargains, they won't be outbidding you at top-dollar because they won't make any money on the item. Most of the time you are outbid, it is by a fellow Classics CN member. 8) Please limit yourself to one "found" post per hour. If you find more items within that time, just edit your post and add them, or wait until you have finished looking at all the ad sites and post them all at once. 9) Short discussions can take place about the items listed. When quoting a post, edit the quoted post to include only the part you are replying to. Do not quote an entire string of replies. If not quoting, make a note of what your reply pertains to, so others won't misinterpret your reply. Please keep these discussions limited to the actual items posted. If the discussion becomes protracted or the noise level gets too high, these posts will be moved to a new thread. Further comments on the item should then be made in the new thread. 10) Ads that are odd or have humor may find a better home in the Favorite Used Telescope Ad thread. Posts that do not follow these posting guidelines or are for items not appropriate for this thread may be removed at moderator discretion. Buyer Beware- CN is not responsible for any of the ads or auctions posted here or their content. There are some scams floating around, so do your homework before pursuing any ad. Remember, keep to the ads and the equipment in them, not the seller or others. Remember the main TOS theme: Be Nice. Posts that do not follow the guidelines may be deleted in their entirety. Don't keep quoting posts that you know do not follow the guidelines. Your entire post will be deleted, not just the quoted section. No more posts complaining about parting out equipment or comments about this thread affecting prices. There are other threads for those issues. ANY POSTS THAT ARE CONSIDERED AS HARASSMENT TO A MEMBER WILL BE REMOVED WITH NO NOTICE ALONG WITH THEIR QUOTES. CONTINUED HARASSMENT OF OTHER MEMBERS MAY RESULT IN UNWANTED VACATIONS. STICK TO THE ADS AND EQUIPMENT AND AVOID STRAYING OFF THE AD TOPICS. No mention of the condition of the optics. Edited by Defenderslideguitar, 01 December 2018 - 08:40 AM. That looks like a very nice scope. And the price is what should be expected. I think these big guys just aren't selling, and they cannot be shipped. Edited by Garyth64, 01 December 2018 - 09:39 AM. C8 Ultima with Clave eyepieces. Would bid but with the Claves it'll probably hit a grand. I would buy it for $500 if I had somewhere to put it. I love the looks. Just not many are going to pay $700 for it. It seems like you gotta give away these older newts these days. Only i seem to pay more for these beast as i really do love them and they don't pop up close to home. And regarding the Circle V Cometron I called the seller, it's missing the accessory tray and he has no eyepieces or other accessories with it. Edited by Tom Duncan, 01 December 2018 - 10:43 AM. Great deal on a 60mm Goto, (complete kit). It’s just like the one I used to have. These are very nice scopes. Looks to be in good shape. It is only the second one I ever seen. I have to say, that mine is in excellent shape, almost new condition, and is cheaper! The Polaris mount alone is worth the price. Yes. Great mount. I have the c4.5 on the Polaris mount. Yes It looks good I like everything about it but that metal tripod I have that style metal tripod on my basketcase scope scope and I do not like it at all.........Now if the mount was riding on a solid wooden tripod...? some boomerang ads......................back after sometime away Big Unitron with tall home made tripod legs folks should remember this from last winter or spring I wonder how those tripod legs work as they are reportedly 6 feet...? Edited by Defenderslideguitar, 01 December 2018 - 03:10 PM. If I were to keep my 14TE, I would keep the metal legs for originality, but I would put the mount on a wood tripod. Also, mine is a complete kit. Edited by Garyth64, 01 December 2018 - 03:07 PM. Yes, it is a great deal. On that Cometron, not so fast about the mount. 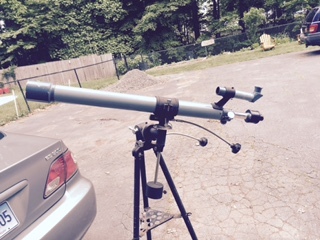 The mount is a step Down from what is considered the typical Polaris mount. The Cometron series alone was Meades market rush, slighty more Dept. Store quality scope. Look at the plastic, focuser, finder, etc. The mount will have the lightest of interior options, and it also has quite a bit of the RA setting circle mechanism GONE. Hardly anyone uses the advanced setting circle windows on the back of the regular Polaris mount, but they are still a significant part of the collectability and significant in function if used. The tripod is distinctly less than what was used on the C4.5 and C6 Polaris. I don'[t know about the accessory end, but I'd bet eyepieces are not Japan series 4000, I could be wrong on that. Just shows how much I still have to learn. I would love to hear comments on this one as I am considering driving quite a distance to acquire it. Now I see it does not look exactly like mine. Dave Trott... If he ain't got it, you don't need it! I started not to post this one, but I just got that Mizar AR-1, which is better for my small scopes. Man! This one looks to be in excellent condition -- it'll make you want to take up 35mm film astrophotography again! Edited by Bomber Bob, 01 December 2018 - 08:24 PM. 2080 on a Mizar GEM. Ridiculous BIN price.